In the center of the composition is a naked Christ standing in the waters of the Jordan. On His head is entrusted the hand of John the Baptist, pictured on the left, on the river bank. On the other side, three angled angels with white veils in their hands. Above Christ, in the white circle the dove is the Holy Spirit in the eight-pointed nimbus. In the right and left parts of the composition are placed smaller images of the text of the Gospel of Luke about the temptation of Christ by the devil. To the right: the devil invites Christ to turn stones into bread; the devil offers Christ all the kingdoms of the universe for worshiping him; the devil invites Christ to rush from the roof of the temple. To the left: the devil leaves Christ. The Christ depicted in the last scene is blessed by God the Father, whose image is placed at the top in the center, in clouds, in a blue sky under a keeled arch. In the left part of the composition are depicted the Jerusalemites coming from the gates of the city and heading towards the Forerunner meeting them with a scroll in their hands. Below in the waters of the Jordan is a people baptized by the bowed John. The composition of the composition includes rare images of the Gospel text. Probably, the master used the sample of the late 18th century. The icon is of artistic significance, it represents a museum interest. 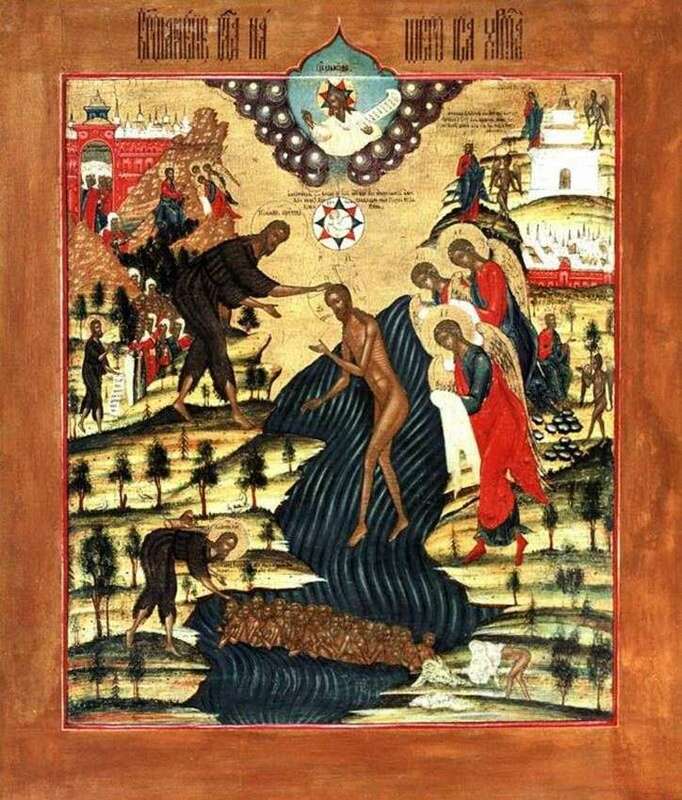 Description and meaning of the painting Theophany with the Gospel Tale of the Temptation of Christ.